Indian cities, like Hyderabad, need to focus on limiting urban growth, investing in natural infrastructure, and promoting clean energy in order to ensure sustainable and efficient development. Photo by Kara Newhouse/Flickr. Cities exist in a region and cannot be defined by their geographic or municipal boundaries alone. The future trajectory of urban growth is often defined by migration patterns from surrounding regions, which in turn, is substantially determined by the relative socio-economic opportunities. It is therefore critical to understand the economic geography of land, water, and energy resources of the region, to be able to properly plan urban growth. People living outside urban areas face livelihood limitations, which is why they migrate to cities in the first place. These limitations are most often linked to the poor management of natural resources. Smart growth planning therefore needs to take into consideration the restoration of these resources in rural or peri-urban areas – the birthplace of urban migration. So which is the best way to go about planning for a future India that is largely urbanized, and growing in unprecedented ways? Here are my top 3 suggestions. I believe that each strategy will ensure urban growth that is both sustainable and efficient. 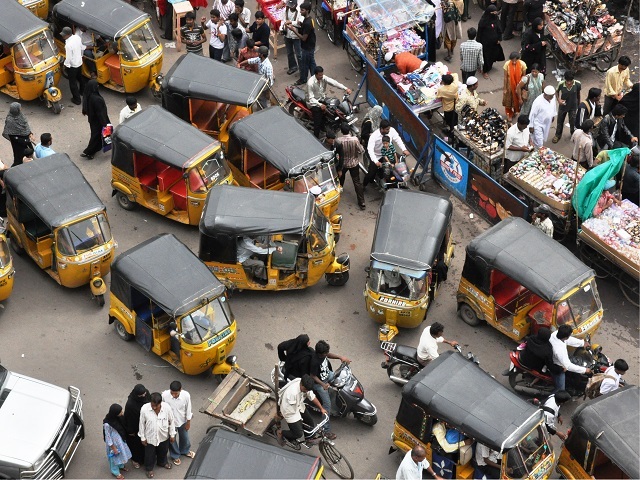 India’s urban expansion doubled from 222 million in 1990 to an estimated 410 million in 2014. In 2000–11, one-third of India’s new towns sprung up within a 50 km neighborhood of existing cities containing more than one million people. Urban areas have become substantial contributors to the national gross domestic product (GDP). This pattern of urbanization in India is lopsided, because there is rapid growth occurring in sprawling peri-urban areas, and on the periphery of existing big cities. Meanwhile, nearby agricultural or fallow land is being rapidly converted to commercial, industrial or residential uses. These landscapes and their resources, such as forests and water, become rapidly degraded and growth becomes unsustainable. We have evidence that the economic, social and environmental cost of unstructured urban growth outweighs the benefits of urbanization. Analysis by WRI, compares two possible futures for the urban expansion of Ahmedabad city, projected to have 13 plus million residents by 2040. The larger the sprawl, the worse the impact on citizens in terms of road fatalities and emissions from road transport. If we limit urban sprawl through smartly designed and cost-effective urban systems such as the transit infrastructure, cities will yield both environmental and social benefits. Citizens can travel safely, quickly and comfortably, they can become healthier and boost their productivity, and the natural resources supporting the city can be put to better use. Limiting urban sprawl means that cities will become compact, efficient, and have a reduced carbon footprint. In 2011, only 71 percent of urban households had access to tap water and 61 percent to treated tap-water. This number falls to less than 50 percent in small and medium cities. Nationally, some 27 percent of urban households depend on frequently contaminated groundwater sources through wells and hand pumps, contributing to the nationwide pressure on declining water tables. It is evident that in a rapidly urbanizing India, groundwater over-extraction, pollution of fresh water sources, inefficient and unsustainable water management and a lack of integrated centralized mapping of India’s aquifers all pose a high risk to water security. Investments in integrated water management policies is thus critical. Results of a WRI study of a watershed development project in Kumbharwadi, located in a drought prone district in Maharashtra, showed an increase in net present value of nearly $ 2.5 million over 15 years. Other benefits included improvements in agricultural and livestock income, as well as savings related to traveling for fuel and government-supplied water tankers. Like water, forests too provide resilience to agricultural and urban landscapes. They perform a number of eco-system services by acting as recharge zones, increasing agricultural productivity, water filtration, flood mitigation, coastal protection and improving air quality through carbon sequestration. In fact, the World Bank estimates conservatively that ecosystem services contribute 3.6 percent to the nation’s GDP. WRI estimates that tree planting efforts in Kumbharwadi resulted in carbon sequestration benefits worth $1 to $1.4 million. In addition, it led to several market and non-market benefits to the community, such as improved fuel wood and fodder supply, improved diet, as well as improved resilience to droughts. Greening India’s urban growth clearly means solid investments in natural infrastructure. This must occur within urban spaces and their surrounds, as well as at a regional level so that urban life can be better sustained by its surrounding forest and water resources. Restoration of degraded landscapes and watersheds through the Government’s Green India Mission will provide multiple benefits toward better livelihoods and environment. While 90 percent of urban India now has access to electricity, the low quality of energy access and irregular power supply continue to be of concern – especially in smaller and medium-sized cities. This means that India must address the large-scale inefficiency in the supply chain of energy services in all sectors of the economy. Energy efficiency is the most cost-effective way to utilize limited energy resources, and national investments in this approach would be a good first line of defense. The Bureau of Energy Efficiency’s programs for energy efficiency standards for vehicles, appliances and buildings need to be pursued aggressively to deliver significant reductions in urban India’s energy consumption, local air pollution and carbon emissions. However, accelerating investments in renewable energy sources will have a game-changing effect on the energy landscape, ensuring a rapid transition for cities and their surrounds towards low-carbon growth. The Indian government’s push toward 175 GW of solar and wind power through private sector engagement is a welcome strategy. Cleaner energy supplies imply preparing the market for structural transformation. We also need to support innovations that also secure social and economic benefits to nurture growth within the sector. Not least, we must help citizens recognize the value of choosing clean energy. Already, through WRI’s electricity governance initiative in Tamil Nadu, TEGI, consumer and civil society groups are demanding this in support of efficient market mechanisms for energy. India has one of the slowest rates of urbanization for its income levels. This gives us a bit of time to choose the right model of urban growth: one that creates well-coordinated, energy and resource efficient cities with the regional capacity to sustain economic growth and well-being for all its citizens. The three strategies I just described have the potential to combine into a model of growth that cities in India can adopt in order to modernize sustainably and efficiently. They will have a positive impact on urban form, as well as the quality of life, for years to come. This article originally appeared on WRI-India.org and RTCC under the title “Three steps to build a greener and climate resilient India”.